Avico Spice is a packer of spices, grated cheese products, fruit and nut products and flavorings. These products are sold in various sizes. The company was established in 1991. The company was previously known as A. Vitagliano & Company, which was established in 1926. The current owners are the grandsons of the owners of the original company carrying on with their reputation for good products and service at excellent prices. Our products are sold to chain stores,restaurants, pizzerias and to individuals. The products are of equal quality to nationally known name brands such as Durkee, McCormick''s, etc. but are at a considerable price savings from those brands. Our products are available in various sizes: small containers for retail or home use, larger size quart containers for restaurants, pizzerias, sub shops and larger gallon and bulk packaging for larger uses. 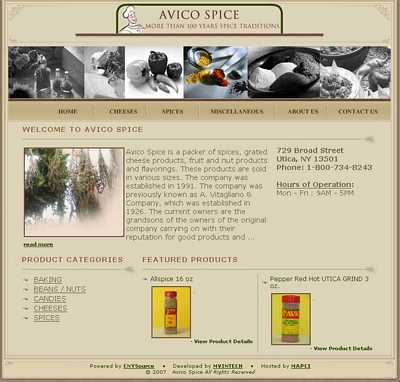 Technologies - Avico Spice utilizes Active Server Pages with a MySQL backend database to deliver dynamic content such as products, news, and electronic documents.